posters | Out of the Box! This art supplement from The Galveston Daily News, September 29, 1918 is a newspaper edition of an original poster by Joseph Pennell Del. 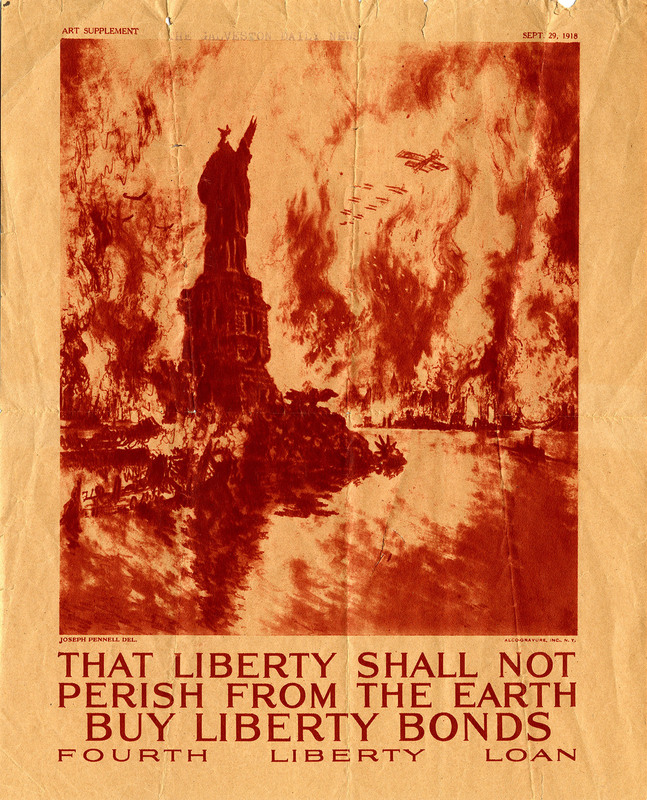 called, “That Liberty Shall Not Perish from the Earth – Buy Liberty Bonds, Fourth Liberty Loan.” The image on the poster shows the Statue of Liberty in ruins, and the New York City skyline burning. The image and words were meant to invoke patriotism so that Americans would buy $6 billion in Fourth Liberty Loan bonds. These bonds would pay for supplies for the soldiers that were still fighting in Europe. In less than two months on November 11, 1918, the Armistice would be signed and the War to End All Wars would be over. Sam Houston Normal Institute sent many students to become soldiers and fight in WWI. When the fighting was over and the students came back the tradition of observing Armistice Day was begun. In 1954 Armistice Day was renamed to Veterans Day. This Veterans Day celebration is still observed today. To see more about Sam Houston State University’s history of honoring the Armed Forces come visit the Special Collection, Thomason Room (named for John W. Thomason, artist, Marine, SHNI graduate) and the University Archives.